» Is there a difference?? Strip is a more invasive procedure, requiring sutures, and recovery will therefore take a little longer and be a bit more painful. Soreness, swelling and numbness will all likely be more intense and persist longer with a strip procedure. 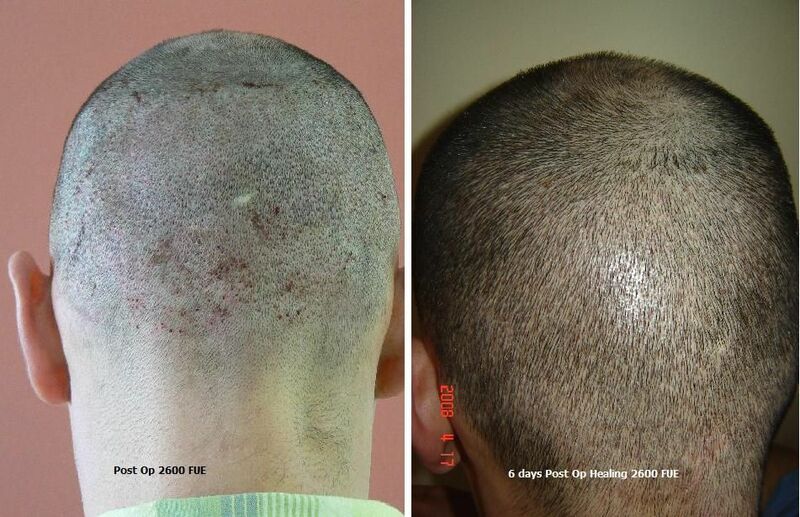 Obviously the extraction of the grafts is totally different, a linear incision across the scalp for Strip as opposed to multiple individual micro punches for FUE. If either is not performed well healing can be impaired and potential larger scarring from both. Assuming both are performed to a high standard then healing from FUE, certainly cosmetically will be faster and easier for the patient. A Strip scar can take a few months for the skin pigment to return to normal, you also have the laxity issue and stretch back of the linear scar if too much pressure is placed on the area in the first few months, so due care is required by the patient. FUE does not have the laxity issue anywhere near the extent of Strip so getting back to the gym and heavy exercises is much faster. Even though FUE punches can cosmetically heal fast there is still the healing process under the skin to think of so a little caution should be used and give it a couple of weeks before putting any real pressure on the area. FUE requires shaving so if you have long hair the change may make a few eyes open at work but after about 10 days or so there is hardly if anything to see in the donor at least, obviously the Strip suture line can be hidden under your native hair in the donor if just a few cms long, so there is the advantage there. » » Is there a difference?? » » » Is there a difference? ?